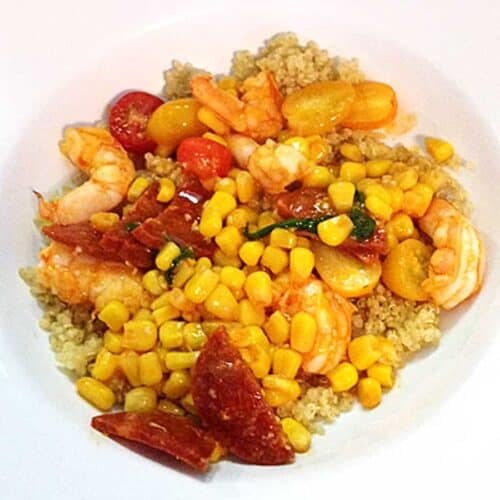 Sriracha Shrimp and Chorizo is a spicy cajun dish with a combination of all the cajun favorites – shrimp, chorizo, corn, tomatoes and basil. 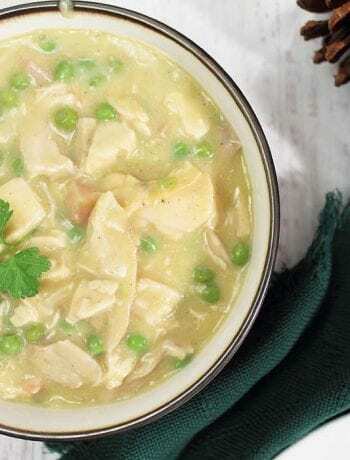 It’s easy to make, taking less than 30 minutes, & perfect for any night of the week. 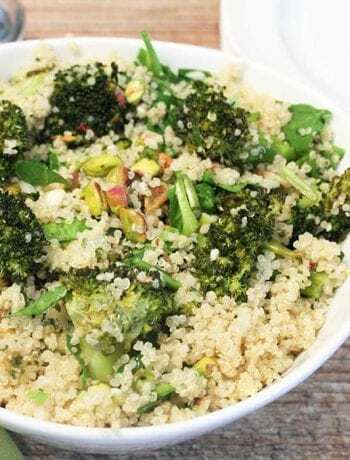 Make it extra healthy and filling by serving over quinoa. If you’ve been following our blog you know that I have found a new love – sriracha! My daughter-in-law was the first to mention it about a year ago and we just got around to trying it in the last several months. She told me I had to buy the one with the rooster on the front – it’s the best! Which turned out to be Huy Fong Sriracha Sauce, and oh my goodness, it had such a wonderfully spicy taste and is the perfect touch to season meat, fish, vegetables and I am sure many other foods that I haven’t had a chance to try yet. Twice a week I turn the kitchen over to my husband for him to whip up some culinary delight in the kitchen and this night he even surprised himself. He found this recipe for Sriracha Shrimp and Chorizo online and adapted it just slightly, and it turned out to be out-of-this-world delicious! And he even served it over protein-rich and healthy quinoa! Yay for my husband! You can speed this dinner up even more by cooking the quinoa ahead of time. You know, meal prep on the weekend. And, if you make extra, it is perfect combined with fruit and milk as a hot breakfast cereal or mix with veggies and seasonings for a nutritious lunch or side like our Southwest Quinoa & Spinach. When prepping your veggies I found a great trick on saving time when having to cut a large amount of cherry tomatoes in half. Just get two large plates, put the tomatoes on 1 plate, invert the other plate and carefully set on top. Take a sharp knife and, while holding the top plate down, run the knife between the plates. Voila, you will have all your tomatoes cut in half in short order. Sriracha Shrimp and Chorizo is quick and easy and perfect for those busy nights after work or running around after the kids all day. Let me know how you like it if you get a chance to try it out. And if you have a favorite sriracha recipe please share it with us. 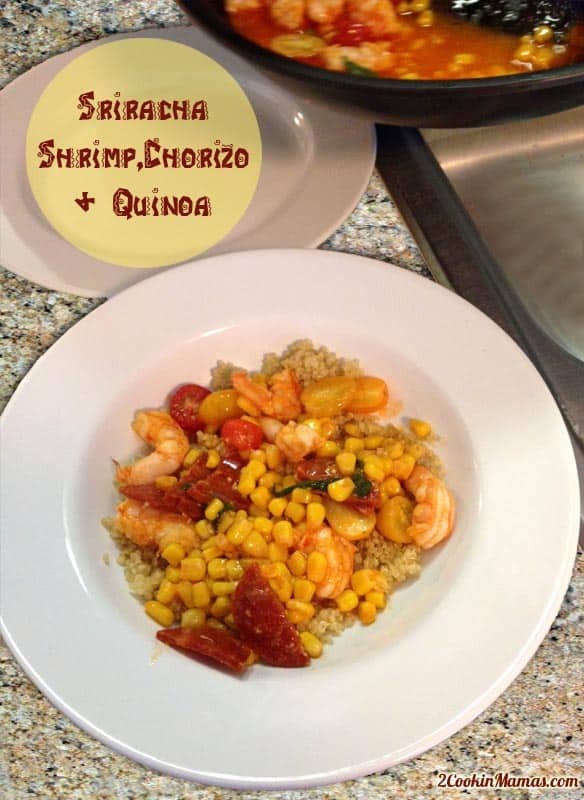 Sriracha Shrimp and Chorizo is a spicy cajun dish with a combination of shrimp, chorizo, corn, tomatoes and basil. It's easy to make & perfect for any night of the week. Make it extra healthy and filling by serving over quinoa. Prepare quinoa according to package directions. I like to make 1 cup quinoa to 2 cups chicken stock or water, put together in sauce pan, bring to boil, cover, turn down and simmer for about 15 minutes. Set aside. 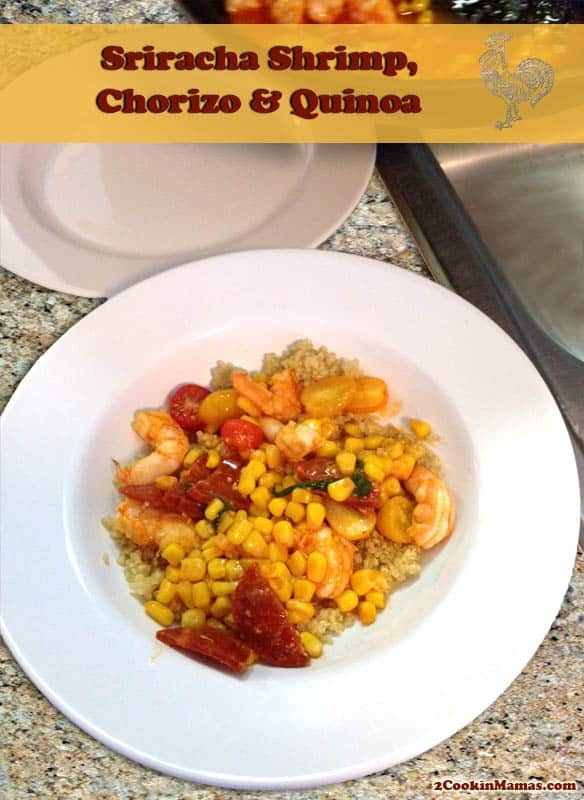 In a bowl, combine shrimp, corn, green onions, sriracha, garlic and chorizo. To this mixture add 1/2 of the basil and 1/2 of the tomatoes. In a large skillet, heat olive oil and add shrimp-tomato mixture to pan. Cook shrimp about 2 minutes per side or until it has turned pink, turning often. To serve: Using 4 wide-mouthed soup bowls, place 1/2-3/4 cup quinoa in the bottom of each bowl. Top each with 1/4 of the shrimp-tomato mixture. Mix lemon juice and zest together and sprinkle over each bowl. Garnish with remaining basil and tomatoes. 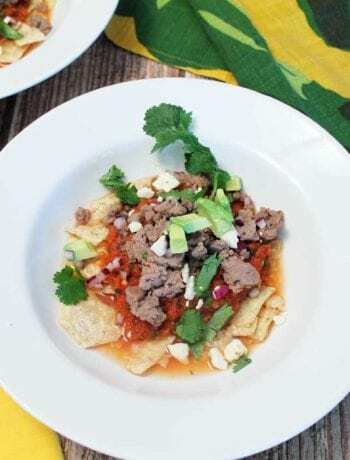 Wine Pairing: This spicy dish requires wines that are crisp, acidic and have fruity flavors with low to medium tannins. Avoid subtle wines and those with high alcohol and lots of oak. For whites, I like Albarino, Sauvignon Blanc, Viognier or an off-dry Riesling. If you like reds, I would stick with a Zinfandel, Beaujolais or a Barbera. Of course, you can also indulge in the bubbly by opting for an Asti or an extra-dry brut.